ST JOHN’S, Antigua, CMC – Chief selector Courtney Browne believes the extended Regional four-day season has allowed his panel to better gauge the quality of players being considered for international duty. Speaking ahead of the new season which bowls off October 26, Browne said the 10-round campaign proved the mettle of players, testing their ability to adapt and challenging the degree of their fitness. “As selectors, we are happy with the length of the season,. We believe 10 matches in the Regional four-day is a good yardstick for the players and for us,” the former Test wicketkeeper said. He continued: “In a shorter season, a player may do well in a few matches and you may consider him, but in the longer season, there will be highs and lows, and you get to see how he handles different situations. 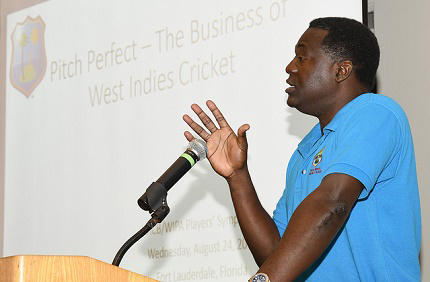 In light of the longer season, which will run for three months, Browne also underscored the need for players to focus on physical conditioning especially since West Indies had also raised the level of their fitness programme. Three-time defending champions, Guyana Jaguars, will do battle with Barbados Pride, Jamaica Scorpions, Leeward Islands Hurricanes, Trinidad & Tobago Red Force and Windward Islands Volcanoes, in the upcoming season. Last year, some of the top performers in the competition like Red Force’s Kyle Hope, Jaguars’ Raymon Reifer and Sunil Ambris of Volcanoes, were all rewarded with spots in the West Indies Test or one-day sides while other players broke into the newly-energised A-team programme. Browne said with these multiple opportunities available, it was critical that players focussed heavily on impressing selectors. “When you look at the regional tournaments, it is a pathway into our representative teams as well,” Browne pointed out. “It is a breeding ground for us and it is very important when we sit as selectors to look at players that have done well in the regional tournaments to identify those players that can go into our “A” Team programme. Browne encouraged players who had not been immediately rewarded for their success at regional level to continue producing and this spoke to their consistency. “There are cases where players do perform and may not make it into the senior team as quickly as persons expect,” he noted. “If there are players in the senior team that are already there, they have to be given a full opportunity and the emerging player will have to wait a bit longer than usual, rather than the chopping and changing approach.